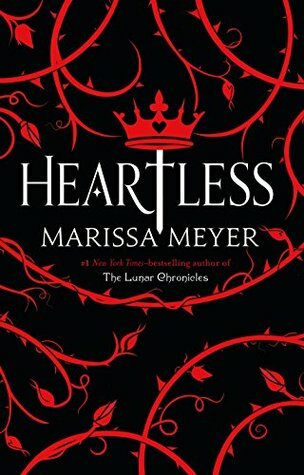 Review: 'Heartless' is a prequel (of sorts) to Alice in Wonderland that tells the story of the girl who becomes the Queen of Hearts. Catherine's only desire is to open a successful bakery in Hearts, but as the only daughter of wealthy parents, that is an unlikely dream. When the king sets his sights on her, her mother is thrilled her daughter could be queen. Catherine does not welcome the kings affection and things become complicated for her when she falls in love with the new court jester, Jest. 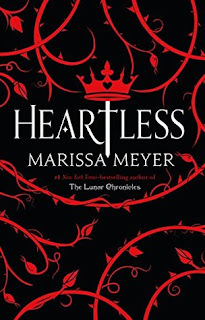 I'm in the minority here, but this book didn't work for me (neither did Cinder, another book most of my friends loved by this author..sorry people). I love the idea of seeing how the evil Queen of Hearts became evil but the story never grabbed me. Catherine's relationship with Jest seemed so undeveloped, her actions at the end didn't ring true. I love fantasy, urban fantasy and science-fiction but I couldn't visualize this world at all. I also thought it was odd that elements of Edgar Allen Poe were added to the story, as well as the nursery rhyme Peter Piper.